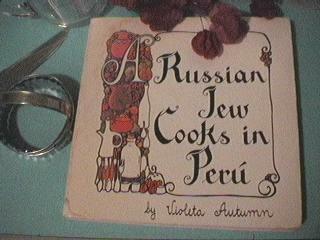 Review of A Russian Jew Cooks in Peru, with a recipe for Garbanzo Balls. In the late 20’s and early 30’s there was an influx of Russian-born Jewish people to Peru. They were young people from the small towns lining the frontiers of Russia and Roumania, along the river Prut in the region of Bessarabia. It wasn’t long before the shock of arrival wore off and they were eating seviche and dancing the marinera with just as much gusto as their genial and accepting hosts. Immigrants as a breed only last one generation; that is what this book is all about. It is an attempt at recording one moment in history that happens to taste awfully good. This is a beautifully crafted book. Each of her mother’s recipes is hand-written calligraphically and embellished pictorially. The only colors used are differing shades of orangeish-brown. The recipes themselves are as varied as the title suggests: Pickled Herring is followed by ‘Jumus’ (Hummus), which is followed by Black Bean Soup and then Pesto Menestrón. And from the refreshing and simple seviche (fish ‘cooked’ by the acidic action of lemon juice)to the ‘rugged Russian cookies’, all are very tasty recipes. There are a variety of sections. Snacks, Relishes, and Appetizers includes Onion & Matzo, dill pickles, and Jrein (a beet and horseradish relish). Soups includes Latin Lentil Soup, Cold Borsht with Sour Cream, and Chupe Chowder. Fish includes Seviche (wonderful! ), and Okopa. Vegetables includes Ginger Carrot Salad, Papas a la Huancaina, and Polita’s Malisnik. Beef, Pork, Chicken, Dove, Duck, Rabbit includes Prakes (sweet and sour stuffed cabbage), Pelotitas (Jewish meatballs in Peruvian sauce), Norita’s Chancho con Tamarindo (pork in tamarind sauce), and a number of recipes with shmaltz (rendered chicken fat). Doughy Things, Pasties includes Nocques, Potato Dumplings, Varenikes, and a variety of Empanadas and Knishes. For Desserts, Cookies, Pastries we have Mrs. Gidelman’s Flan, Arroz con Leche, Cachitos, Nut Torte, Apricot Soufflé, and Picarones. Finally, Breads consists of Koilich, Bublichki/Rosquitas (pretzels), Peisaj’ke Bagel, and Povet’l (prune jam). If you ever run across this book in a used bookstore, I strongly recommend taking a look at it. You will know immediately if it is the kind of book you want to read and cook from. Add eggs, minced onion, salt, pepper, matzo meal. Make into 1 inch balls and deep fat fry until golden. Make the hot sauce by mixing onions, hot peppers, olive oil, parsley, wine vinegar. Marinate one hour. If you enjoy 101 Productions, you might also be interested in French Cooking Simplified With a Food Processor. If you enjoy cookbooks, you might also be interested in A Concise Encyclopedia of Gastronomy, Bull Cook Historical Recipes, Cavalier Cooking, Classic Chinese Cuisine, Cooking the Bahamian Way, Country Commune Cooking, Life, Loves, and Meat Loaf, The Art of Korean Cooking, The Casserole Cookbook, The Complete Book of Oriental Cooking, The Complete Bread Cookbook, The Frugal Gourmet Celebrates Christmas, The Healthy Cuisine of India, The New Larousse Gastronomique, Saucepans and the Single Girl, The Northwest Cartoon Cookery, Good Food From Mexico, Laurel’s Kitchen, The Cooking of Vienna’s Empire, James Beard’s Fireside Cook Book, French Bistro Cooking, A Fifteenth Century Cookry Boke, Crockery Cookery, Southern Cooking, The Frugal Gourmet Keeps the Feast, The Fannie Farmer Cookbook, French Cooking Simplified With a Food Processor, In Good Taste, Heritage of America Cookbook, Our Favorite Hometown Recipes Vol. II, The Indian Spice Kitchen, Japanese Country Cookbook, La Cuisine Française, Larousse Treasury of Country Cooking, The Natural Foods Cookbook, Soul Food Cook Book, The Tassajara Trilogy, Pains Spéciaux & Viennoiseries, Whole Earth Cookbook, The Wok: a chinese cook book, Southern Living Cookbook for Two, Lebanese Cuisine, The Art of Syrian Cookery, Popular Greek Recipes, In a Persian Kitchen, The Art of Pennsylvania Dutch Cooking, and The Southern Living Cookbook Library. A beautiful book with wonderful recipes, each hand-written. A Russian Jew Cooks in Peru last modified April 3rd, 2013.